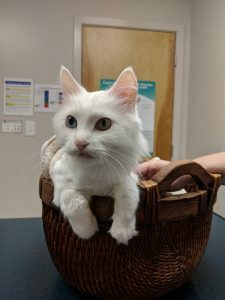 This is Bano, a 7 year old cat, who had evidence of dental disease on a routine exam. He was subsequently admitted for a dental assessment (including full mouth x-rays) and cleaning. The oral exam and radiographs revealed multiple “resorptive lesions”. These are common in cats and are very painful. Affected teeth were extracted and when Bano was seen for his 2 week follow up his owner reported that he seemed much happier, more comfortable, and was not hissing at their other cat nearly as much. Bano had never shown any obvious signs of oral pain which is typical in both dogs and cats…they just do not tell us when their teeth hurt!!! !